Mook Review: The Hunger Games: Mockingjay – Part 1 | mookology. November 21, 2014 November 21, 2014 / Mookology. First, read my review on The Hunger Games and Catching Fire! 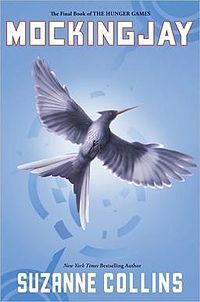 After flying through both The Hunger Games and Catching Fire, my brain could not WAIT to absorb Mockingjay. Catching Fire ended on such a major cliffhanger and I was intrigued, anxious, and excited to see what was going to happen in Panem. The concept behind Mockingjay is awesome, and it had the opportunity to be the best of the three. A rebel army hiding beneath the surface of the long gone District 13? An emerging new leader, ready to take on the Capitol? A deranged and depressed protagonist who needs to become the face of a rebellion? Collins’ third installment really spoke to the idea of a revolution. Executionally, Mockingjay could have been a lot better. The first half of the book really dragged on and I was desperate for Katniss to come out of her slump and be the heroine we all expected her to be. While it is extremely believable that Katniss would have some very serious mental debilitations following her second round of games, it just didn’t work for me. The first part of the book seemed very repetitive and while I understood the direction Collins was taking the story in, and I didn’t really believe Katniss was depressed. About a third into the book is when Mockingjay really picks up speed. Katniss finally comes alive and it begins to feel like the story I wanted it to be. Of course, Collins does a fascinating job of surprising the readers. The reunion of Katniss and Peeta is devastating and I think I gasped out loud when I first read it. Halfway through this novel I was desperate to finish reading, clutching onto Mockingjay in my bed into the late hours of the night, fighting off sleep so I can just read another chapter. And then… it’s over. I have to say I was REALLY disappointed with the ending of Mockingjay. Towards the end of the book, Mockingjay gets so intense, so action packed, so heart wrenching and dramatic, with an intensity that spans through many chapters. But it ends abruptly and with a quick summary of what happens to our characters and Panem. I put down Mockingjay wanting more, and not in a good way. Needless to say, Mockingjay was my least favorite of the books. I struggle a lot with the way the final story is told and really didn’t find it as good as the others. It starts too slow and then picks up just in time to fall flat again. Also, there were times towards the end where the action scenes were too complex that I just couldn’t wrap my head around it. That said, I do believe Mockingjay will be a GREAT movie – not necessarily better than the first two films, but definitely a better movie than book. Unfortunately, it just wasn’t the novel I wanted this story to end on. With this film, I was not disappointed. 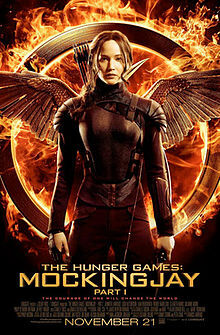 Jennifer Lawrence is really just a force to be reckoned with and she pulls off the damaged version of Katniss so well. I did feel like “Mockingjay – Part 1” jumped a little too quickly into the action. I would have liked a few more scenes with Katniss struggling to adapt to life in 13, but I understand it was necessary to get right into it for the sake of time. Once the action starts going, “Mockingjay – Part 1” takes off without a hitch. Parts of this movie were so moving; for example, when Katniss arrives in District 8 and walks through the hospital and is barely able to keep herself together, I had chills. And Julianne Moore, as the stone cold Alma Coin, is absolutely perfect. She has just the slight touch of evil that makes you really dislike her – and you can tell Katniss does too. I had a slight issue with Peeta’s appearance. I thought the CGI of the final two scenes of him in the Capitol’s videos were not believable and looked really fake, although I thought the acting was great. Since Mockingjay was split up into two feature films, I had speculated (as many have) that it would end on the reunion of Katniss and Peeta. I was right. And it was intense. It was one of the best scenes in all three of the movies and everyone in the audience felt pain watching the scene. It was a great moment to close on and really left you wanting the next, and final, installment of “The Hunger Games” franchise. While I did enjoy the movie so much more than the book, it didn’t quite make it to the success of “Catching Fire” …but that is ok. In some ways, “Mockingjay – Part 1” did just feel like a set up for the second movie and it definitely can’t stand alone on it’s own. But it was successful in what it set out to prove and really showed the audience that there are no more games – this a real war. A Rebellion. And it is just getting started. I definitely am anxious to see what “Mockingjay – Part 2” will bring and if it will have a greater impact than the book did. Here’s to waiting another year for the close of this great series! I have to admit, that the ending is something, you have to get used to. But then, it is not a story, where a perfect happy ending would fit. (And being honest, I liked this ending better, than the one of Divergent, which was unbelievably shocking and devastating). I wasn’t looking for a happy ending, necessarily. I didn’t mind the ending itself at all. I just felt it was rushed. The story just finished abruptly and without any explanations about the characters, even though SO much time went into explaining all of the action that came before it.